Changes have been announced to the shuttle bus service to Trumpington park and ride. Read the Latest musings from Little Shelford and beyond in Shaista Tayabali's Cultural Corner. Newton Road will be closed on 22nd May for one day 7:30am to 6pm while man covers are replaced - a diversion will be in place. A record number of volunteers turned up for the village spring clean on March 3. A new bus service from Little Shelford to the Trumpington park and ride site launched in December. The Navigator pub has had a face lift. 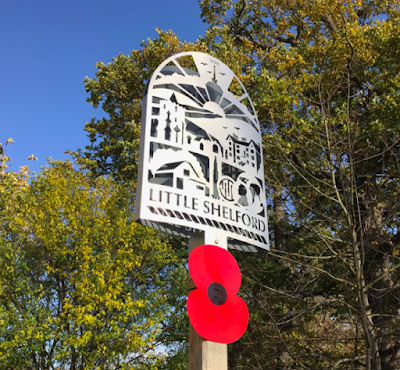 Giant poppies were placed around Little Shelford to remember the 13 men from the village who gave their lives in World War 1. A bike was stolen from a home in Hauxton Road between Nov 3 and 6. 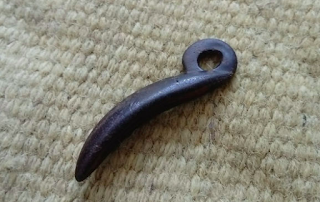 Number plates were stolen from a grey Vauxhall Astra which was parked outside of a house in Whittlesford Road on October 29. A new Yoga class started in Little Shelford in October. BBC Look East presenter Janine Machin and Shelford school teacher Mike Paduano opened the new £85,000 playground at Little Shelford Rec on September 8. "You have got a playground that many villages would die for," said Janine. Photo; Sandy Boyle. This photo of the Little Shelford pond by Brie Lury was the winner of the Shelford photo competition. Win a signed copy of Sarah Vaughan political thriller, Anatomy of a Scandal. A water feature was stolen from a garden in Newton Road, Little Shelford on July 21 between 11.30am and 6pm. Has anyone else noticed how lovely the lime tree is looking on the village green? It was specifically chosen for the silver under leaves and it’s looking really lovely at the moment and is developing a good shape. It’s also looking remarkably healthy despite the recent heatwave. Christine Ruffles and Penny Saich are very pleased to report that £1400+ was raised for the Arthur Rank Hospice, at the ‘Drinks and Canapés’ event on Sunday. So many grateful thanks to all those who supported us and very special thanks to the generous ladies for their contributions of delicious food. Work is due to start soon on the new Playground now campaigners have reached their £84,000 target. A Ford Transit parked in Whittlesford Road, Little Shelford, had the near side front window smashed. Nothing was taken from inside the vehicle. This happened between 11am and 2.20pm on April 21. Local groups who want a stall at the Just for Fun village show need to get in touch with Gail Pilkington. Fungus spotted in Bradmere Lane - photo by Dave Pate. Looks like our twin town, Verneuilles, in France has borrowed an idea from Little Shelford. New speed monitors have been introduced in the village to encourage drivers not to speed through Little Shelford. Three vehicles in Moor Close had their wing mirrors completely broken between 10.am on March 16 and 2pm on March 18. 25 bags of rubbish were collected around the village volunteers on Feb 25. A microwave and an in-date credit card were among the items picked up. A professor from the Medical Research Council who lives in Little Shelford was knocked off his scooter outside the school on Saturday morning by a car overtaking the parked cars. He's got a broken leg and two brain bleeds. Shelford Medical Practice merged with the larger Granta Group in 2018. There was a distraction burglary in Little Shelford in November. 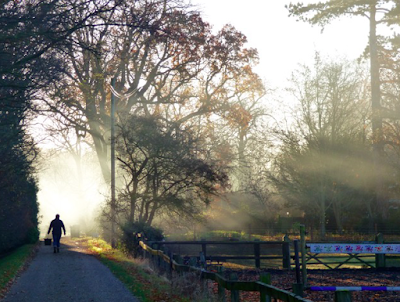 The sun captured over Little Shelford on October 16 by Ruth Shah. See more of Ruth's sunshots here. Several thousand pounds were taken in a burglary at Winners' Chinese restaurant between September 13 and 14. A new book about Little Shelford is now available to buy. The iconic milestone in Whittlesford Road has been beautifully repainted by village volunteer Bill Savin. The Navigator is now open lunchtimes and evenings, seven days a week under a new manager. A drone flight around the nearby obelisk has emerged. The water pump in High Street has been spruced up by villager Bill Savin. The new Great Shelford Post Office has opened in Hinton Way. A new gate has been installed at the Wale Recreation Ground. More than 80% of people in Little Shelford are very or quite concerned about the speed of traffic in the village according to a new traffic survey. 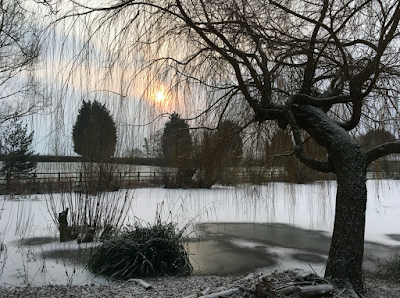 A winter's day in Little Shelford by Ruth Shah. Parish Councillor David Munro is pictured with the new Defibrillator he has helped organise for the village - its been installed on the wall of the Navigator. More than 40 people turned up for the Little Shelford footpath inquiry which took place in January. The whole of the Armistice Day service at All Saints was recorded, and is available via the November 2018 section of the All Saints web site. The MP3 of the recording is available directly at https://tinyurl.com/ASLS-ArmisticeService. More than 200 villagers and All Saints members packed out the Church for the special service on Sunday Nov 11. A wreath was laid inside the Church by John North, a villager from Hauxton Road who served in the Fleet Air Arm before a wreath was laid by Major Andrew Carrothers of High Street at the Village Cross and then the young people laid small wooden crosses at its foot. It was a very inclusive and very moving service. 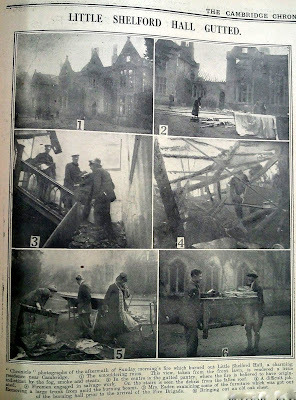 Edward Maitland from Little Shelford was on the first airship flight across the Atlantic in 1919. 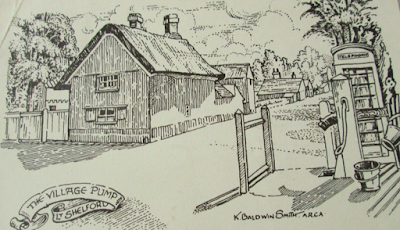 One of Little Shelford's water pumps and a house that no longer exists in High Street are featured on a postcard that was recently for sale on ebay. There are hundreds of old photos and pictures of Little Shelford in days gone by on a special history website. Little Shelford Parish Council invites villagers to inspect their accounts including the annual return and the annual governance statement. World War One manoeuvres by troops in Little Shelford have been highlighted in a new book. 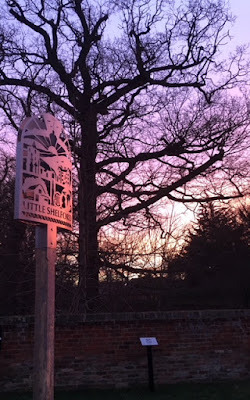 The village sign on the smallest village green in England photographed by Ruth Shah at sunrise on Jan 2 2018. See more of Ruth's Little Shelford photos here. 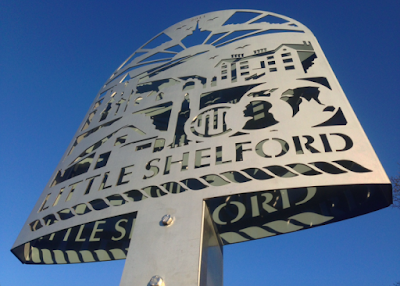 Little Shelford Online has a fascinating new section, focussing on cultural offerings in and around the village. 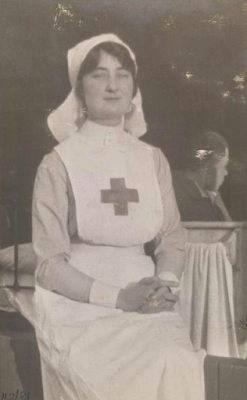 A photo of Fanny Wale, Little Shelford's first historian who died in 1936, has emerged. A rare postcard of Little Shelford Hall, which burnt down in 1929, has emerged. 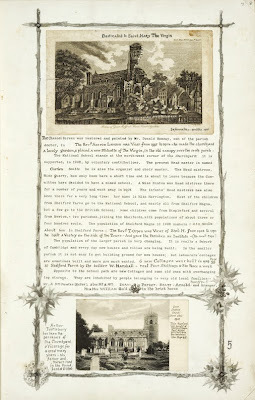 You can read about the hall on the Little Shelford history website. Doug Walker from Little Shelford who received a telegram from the Queen to mark his 100th birthday in April. Sunset over Little Shelford, Jan 18 2017 by Ruth Shah. 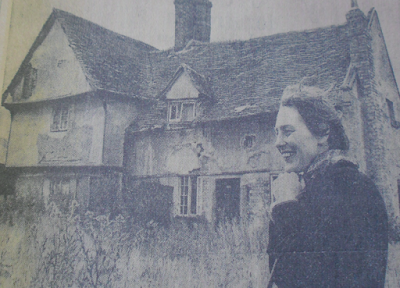 The mystery of a house that was due to be re-built in Little Shelford 50 years ago has re-emerged. A new village sign was finally installed in November. It is part of a new mini village green created at the junction of Church Street and Manor Road. More than 300 people turned up to see former England cricket captain Tony Lewis (pictured left) open the new £380,000 sports pavilion. This newly-discovered photo of the High Street in Little Shelford, complete with horses and carts, in one of dozens of old photos on the village's history website. A fascinating book about the history of Little Shelford has been republished- and you have a chance to buy your own copy. It would make a great Christmas present for history lovers. Details have emerged of a visit by Edward VII to Little Shelford. The episode is included in a book that has just emerged called A Record of the Shelfords Manga and Parva in Cambridgeshire.